Leaf Removal: Should I BAG or MULCH? What’s the least favorite outdoor chore? 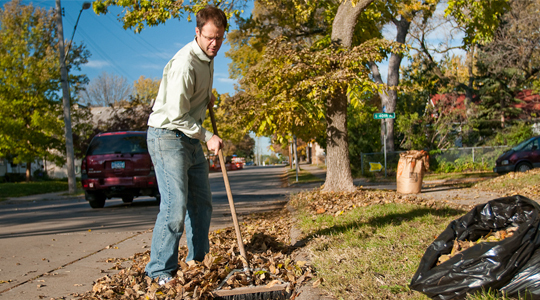 Survey says… Many people claim raking and clearing leaves is the job they dread the most. Since leaves just don’t vanish into thin air, you’re stuck with a few ways to clean up your yard during Fall. Here’s a few suggestions that will help you easily decide whether to bag, mulch, or use the leaves for compost. Bagging leaves gives your lawn a fresh groomed look, instead of seeing piles and clusters of leaves spread across the grass. Leaves can smother your lawn if enough of them build up, preventing sunlight from reaching the grass and increasing the chances of disease. Collecting the leaves in bags allows your lawn to breathe and receive proper sunlight. Bagging is great when dealing with pine trees that leave lots of needle clumps on the grass. Pine needles are more difficult to mulch. Many leaf bags are biodegradable, so they can decompose with the leaves. Entertainment! With Halloween in October, some people like to use pumpkin designed leaf bags as decoration. Also, leaf-pile-jumping has continued to be a popular Fall activity. Purchasing bags, and in some cases, paying for disposal is a huge disadvantage, especially if you have a ton of leaves to clear. Some areas do not provide leaf pickup, and many garbage services won’t allow leaves to be dumped in a landfill. Whether you’re using a rake or a leaf blower, collecting leaves and placing them in bags can be a tedious and grueling task. Leaves are a valuable recyclable resource for your lawn. Bagging, instead of mulching, takes away the nutrients those leaves can provide to the soil. Leaf bags that are not biodegradable will not decompose with the leaves, making them environmentally unfriendly. Another option many property owners use, is to collect the leaves with a lawn mower grass collector bag or a grass catcher for riding mowers and zero turns. 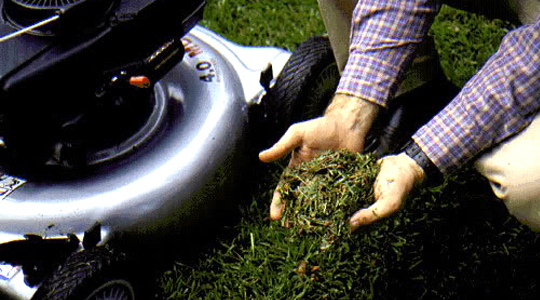 A lawn mower with mulching capability can chop up the leaves and discharge them into the grass collector attachment. The benefit to using a bagger attachment with your lawn mower is you can cut the grass and collect leaves at the same time. However you still have to discard the grass clippings and leaf debris somewhere. Some people put it in bags to dispose of, while others find it easy to use as mulch for their garden or material for a compost pile. 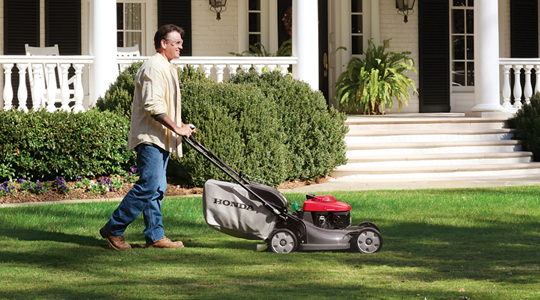 A vacuum capable leaf blower is another method to bagging leaves if mowing the lawn isn’t necessary. When you have smaller amounts of leaves or debris on your property, vacuuming them is definitely an easier task. The incorporated mulching function helps reduce the vacuumed material to increase bag capacity. But if you have a large amount of leaves to clear, don’t use the vacuum feature because you’ll end up emptying the bag quite often. Lawn care experts claim, whenever you have the opportunity to mulch, do so if the conditions are right. As mentioned before, you can mulch the leaves by chopping them up with a mulching lawn mower. But this time, remove the collector bag so the leaf debris can remain in the yard. There are special gator mulching blades recommended that chop the material into finer pieces, so the mulch can settle easily into the lawn. Leaf mulch is food for your lawn. Like fertilizer, it provides nutrients to the soil to keep your yard healthy. You’ll have a greener lawn in the Spring if you mulch the leaves with the grass this Fall. Mulching also helps decrease weed growth and moisture evaporation in the soil. Mulching saves you time and energy by accomplishing two tasks at the same time (cutting grass and clearing leaves). You won’t have to pay for bags or disposal services. Avoid over-mulching. Do not mulch if there is an overabundance of leaves on the lawn. Mulching too much material at once can leave clumps (mulch buildup) in the yard that can smother the grass. Trying to mulch too many leaves with your lawn mower will cause it to clog. It’s like mowing through tall grass on an overgrown lawn. The mower blades won’t be able to efficiently handle the amount of material. When you find yourself overwhelmed with leaves, you should remove a good portion of them with your rake or leaf blower before attempting to mulch with the lawn mower. If you want to learn more, read our article on The Benefits of Mulching Your Lawn. A compost pile is a collection of organic material (leaves, grass, etc.) that decomposes to form nutrient rich compost, which can be used as a type of fertilizer for your gardens, plants, and trees. Compost can be a great substitute for top soil. The leaves you collect from your yard every Fall are a nice addition to a compost pile. However, making compost takes time, as decomposition doesn’t happen overnight. Sometimes it takes 3 months to a year to make a decent compost pile. If you’re into the fresh, well-groomed lawn look, you might want to think twice about compost piles if you don’t have an appropriate place to harvest one. They aren’t exactly a thing of beauty to look at. On the other hand, there are compost containers you can use to place the material in. It’s a good idea to mulch the leaves before using them for compost, in order to speed up the decomposition process and save space for more material. As the leaves begin to drop, come up with a leaf clearing plan. When you consider the equipment you have, the benefits and disadvantages of each method, and your own personal preferences, you’ll be able to make a smart informative decision on how to handle the mess of leaves that invade your lawn. Just remember, mulching is more beneficial to your lawn’s health, while bagging is mainly for aesthetic appeal. But some prefer to use a combination of both. For example, if you have layers of leaves piling up in your yard, you can collect and bag a good portion, then mulch the rest with the lawn mower. 3 Responses to Leaf Removal: Should I BAG or MULCH? If you have small leaves they will form pockets between the grass and keep the grass from spreading out. I only mulch when there is a small amount of leaves on the ground. I don’t ming leaving the cut leaves as mulch because the blade on my lawnmower is a mulching blade. I prefer to fertilize more often to insure my grass and dirt have the necessary nutrients in them. 1) Mulching of deep leaves can work. You need to take half cuts and go east west and then north south. Even a foot of leaves will be turned to dust and not smother the grass. It’s better with proper mulching equipment including the blades. (I like gator mulchers). You also have to mulch dry. 2) Mulching with a mower should be planned a bit. Plan to do your lawn the day before rain is expected. Rain will wash in the leaf mulch and you won’t even know it was ever there. 3) Combine 1 and 2 above for a really nutritious feed for your lawn. We mulch with an old Wheelhorse 520 and a 42” mulching deck and our lawn looks spectacular. We have an acre of big mature trees that have a lot of leaves. No raking or bagging or “stupid irritating everyone around you leaf blowers” involved at all. Very helpful tips, Michael. Thanks for sharing.